You might remember me posting about this one last Easter. 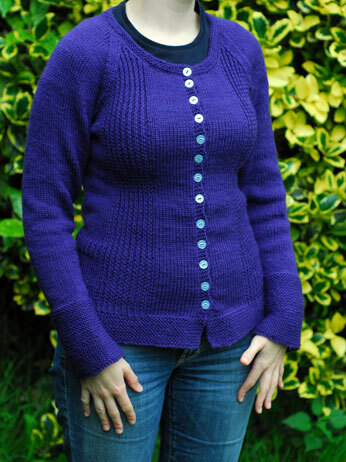 This was one of my speediest knits ever but it still took me ages to get around to sewing the buttons on! 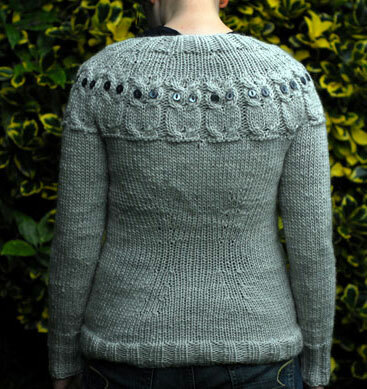 Pattern: Owls by the blogger ‘needled’. Yarn: Cocoon by Rowan, 6 balls. Needles: 6.5mm and 7mm Knitpicks if I remember correctly. 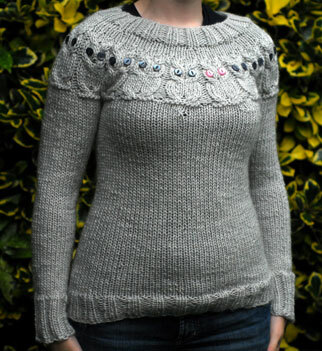 Because of the big needles and thick yarn this knit up ridiculously quickly! The yoke was a lot of fun to knit and I really like the fit of it. As you can see from above, the waist shaping is knit in the form of darts at the back. 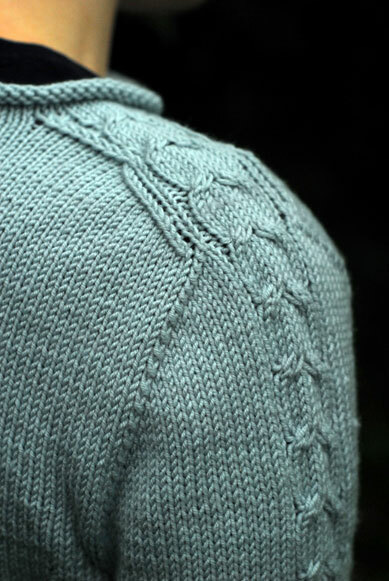 I would definitely recommend this pattern if you’ve never knit a circular yoke before; it’s really straight forward. The buttons were a necessary evil but I think they were worth it! To give you a break from all the jumpers I’ve got some works in progress to show you! 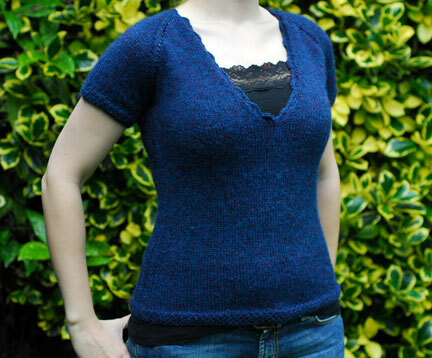 First up is Veronique from French Girl Knits. I’m knitting it out of Lorna’s Laces Helen’s Lace… it is very fine but gives a lovely drapey fabric. It looks a bit funny at the moment – here’s how it looks in the book. I think it will look nice over jeans for a smart-casual sort of look. Also on the needles is my Eco Wool colourwork hat. I still love the smell of this stuff! Very sheepy. The ear flaps are next on this – my favourite bit! I finally heard back this week about my audition… Drumroll please…. I didn’t get in! I was a bit disappointed at first but now I am not very, considering how odd and bizarre the actual audition was. And, of course, now that I don’t have to move country, we’ve been able to get organised about lots of other things we were keeping on hold until we knew was was going to happen. Some small things like finally buying a wok, fixing my bicycle basket and sussing out language classes for the Autumn, and some bigger things like getting my driver’s licence, switching broadband provider, a better way to sell my patterns and thinking about training for a half marathon in March. I will apply next time round to other schools and obviously by then, I will have more experience under my belt and hopefully a few language certificates, too. I finished this up a few months ago but never got around to photographing it. Pattern: Layered Skater’s Top from Knitting Classic Style by Veronique Avery. There is a light mohair tshirt that is paired with it in the book but I thought that the undertop would make a nice thermal longsleeved shirt by itself. Needles: 3.5mm (for the body) and 3.25mm (for the hem) Knitpicks. Yarn: Baby Cashmerino by Debbie Bliss, from This is Knit; 8 balls. Modifications: None, unfortunately… if I were knitting this again, I would make it longer by about 20 cm. I lovelovelove the saddle shoulder shaping. I’d never knit it before and I think it is a shaping I will definitely come back to. It seems to look good on everybody! I think I’ve said this before but I wish that Baby Cashmerino didn’t have the ‘Baby’ in the title. Everyone seems to forget that it is a perfect sport weight yarn because of it! There are a lot of patterns out there that call for a sport weight – sort of a light DK – and the Baby Cashmerino really fits the bill. The colour range has really improved in that weight over the last year, with stronger colours being brought in to complement the many pastels. I know a few people have some beef with the Cashmerino range, mostly from a pilling point of view. From what I saw in the shop when I worked there, this seemed to be mainly with the Cashmerino Aran and mainly with people who insist on chucking their sweaters into the tumble dryer. I knit this sweater a few months ago and it still looks like new. Perhaps the Baby Cashmerino is more tightly spun than the Aran? Maybe it is a problem that befalls loose knitters? Or perhaps it is simply a sign of a well-loved sweater? Any jumper that’s worn enough is going to look worn, right? (Take my Central Park Hoodie for instance… never has there been a more obviously worn jumper!) Theories in the box below, please! PS: I seem to have had a few issues regarding my hosting over the last few days… the index, category and archive pages weren’t loading and none of my posts were being picked up by RSS. It seems to have been fixed so you will probably find a cluster of posts all together so apologies for what looks like a bombardment! This was a very quick knit. I stalled out at the end because I didn’t like how the scalloped neck edging came out the first time and was too tired to redo it. But I did eventually and here’s the result! Yarn: Berroco Ultra Alpaca Light, 4.2 skeins. This was a yarn I picked up in Chicago this time last year. Berroco tends to have a lot of novelty yarns but I came across some killer staple yarns by them while I was there, too. This is one of them: 50% super fine alpaca, 50% Peruvian highland wool. Needless to say, this is a very warm tshirt and I intend on wearing it as a layer in Autumn and Winter rather than a stand alone shirt in Summer. Modifications: The only modifications I made was to re-crochet the neck edging with a 3mm hook and with a disregard for the pattern’s instructions on how many scallops to make. The result was a firm neckline that should stand up to being pulled on and off. 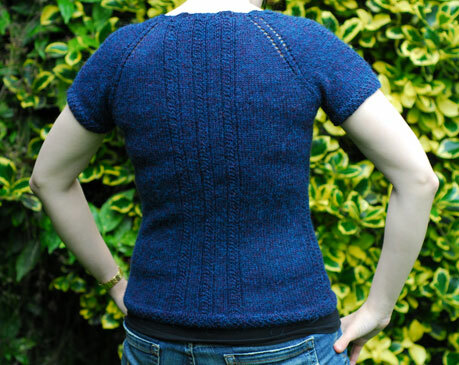 Like Amelia, I am a big fan of how the ribbing across the back and sides do all the shaping for me. In a way – and this does depend on the type of garment in question – I would prefer it to standard waist shaping. From a pattern writing point of view, it makes life a LOT easier! This is a simple, straight forward pattern and I would definitely recommend it to someone who hadn’t tried the top-down all-in-one method. It is a quick knit but the resulting garment is still quite light which makes it perfect for layering. Thumbs up from me! Pattern: Amelia from last Winter’s Knitty. Size: 34″ knitted on larger needles to come somewhere between 34″ and 38″. Yarn: Brown Sheep Nature Spun Worsted, 4 balls and a bit from This is Knit. I bought six and so am delighted I will have plenty for a hat and mittens or perhaps even a vest. Actually, that gives me a great idea.. Needles: 5mm Knitpicks circular for the whole garment. 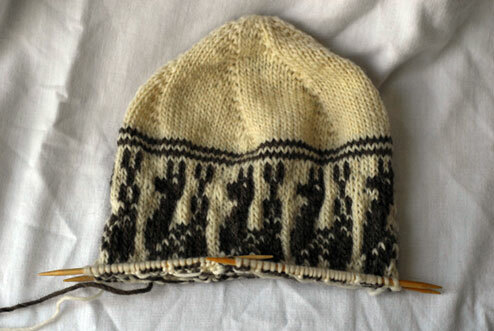 I used slightly larger needles because I knit the 34″ size and wanted it to come out between the 34″ and 38″. I know that different needle sizes are suggested for different parts of the pattern. 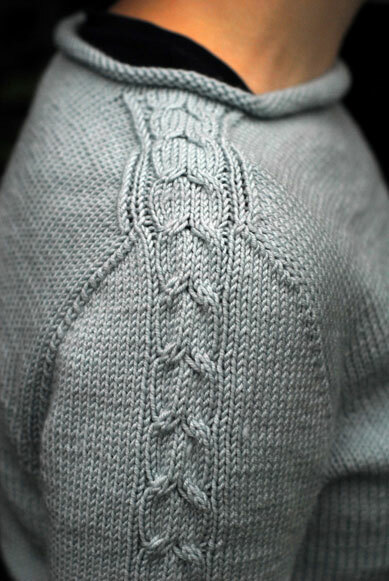 Going by the fact that I got gauge (for what I wanted) with 5mm, I knitted the basque with a 5.5mm needle. This was a mistake, even though it turned out fine. Garter stitch spreads a lot and I think the finished basque would have been that little bit firmer had I gone with the 5mm. 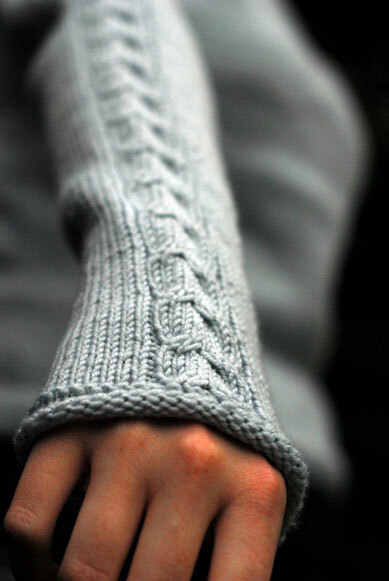 I knit the cuffs on the sleeves as well as the rest of the sleeves and body on 5mm. Buttons were cheap-o ones from Trimmings on the quays but do the job and to me, are the perfect colour. They are slightly blue and so bring more blue tones out of the purple yarn. 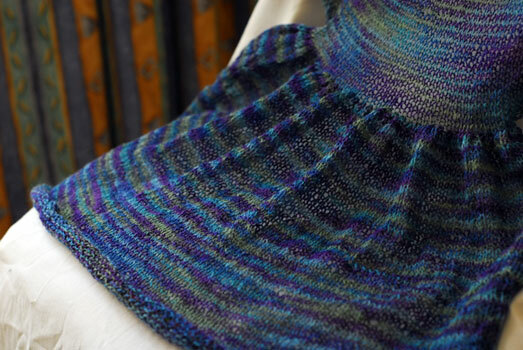 The only modifications I made were to start the button holes immediately after the garter stitch basque instead of waiting until halfway up the body. On my shape, this made a vast improvement. All in all, it was a straight forward pattern and with the aran weight yarn, a very quick knit. The ribbing across the fronts and back mean that it’s flattering to different shapes (especially if you extend button holes, I think). I suppose the only thing I would warn against is to make an educated decision on using a bigger needle for the garter stitch sections. Mine tends to be quite loose, but everyone is different and you should probably choose your needle size accordingly.